December | 2013 | "Let's Talk, New York!" 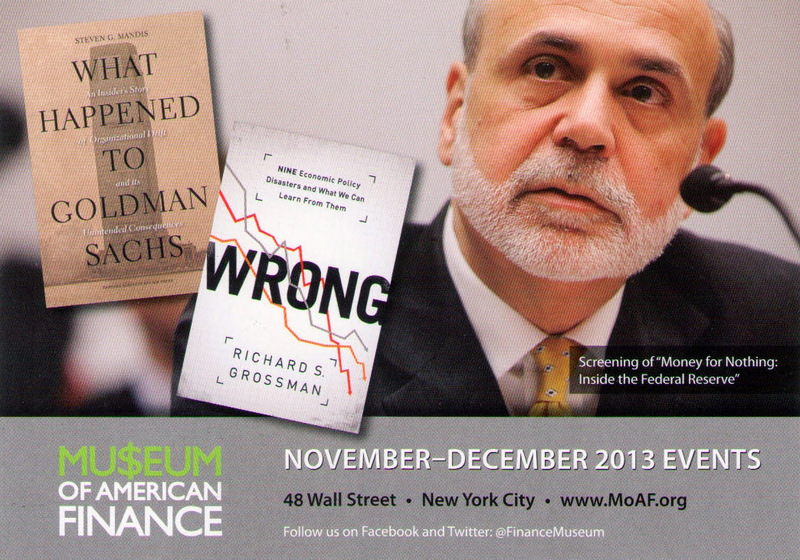 This lecture is offered by the Museum of American Finance. An audience Q/A follows the lecture and after the Q/A, we will have a “TalkAbout” on what we heard in the atrium next door, 60 Wall St.
Gottesman Library, Teachers College, Columbia University, 525 West 120th St. Your life in New York City will be effected by the new Mayoral administration. Here’s your chance to have your say. What are your ideas for helping all of us to live together more enjoyably, healthfully, safely, and productively? The Talking Transition Project(http://talkingtransitionnyc.com/)* has invited us to discuss our future. Such conversations have been taking place online, in the streets, at libraries throughout the city, and in a big white tent thrown up Canal Street and Varick after the election (now closed). What changes would you like to see in the area of city living of most interest to you?….e.g., our streets, parks, schools and colleges, healthcare, local businesses, housing, immigrant integration, environment, law enforcement, rules, regulations, and priorities for spending public funds? Output from our Conversation will be displayed afterwards at the Gottesman Library, to stimulate on-going discussion on campus, and will be transmitted to the transitions team. *The project is not a part of the de Blasio administration, but is an initiative of a group of foundations led by George Soros’ Open Society Program. For more information about the Socratic Conversations: www.SocratesWay.com/join.html. NEXT CONVERSATION: Thursday, Jan. 23, 2014.